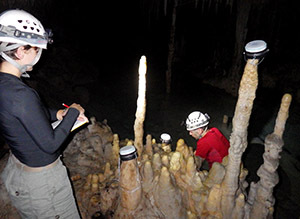 An event logger counting drips from stalactite formations in dry caves. 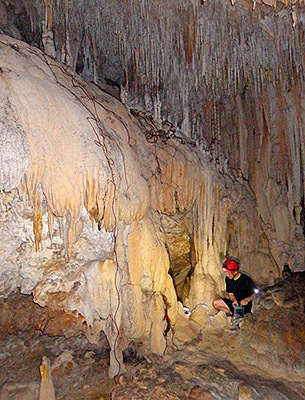 These large soft formations often form around the tree roots that drill down into the caves from the surface. I brought six new units to cover attrition of the older drip sensors, but with only one failure in the last round, the scheduled replacements left us with several ‘old but still working’ loggers in hand. 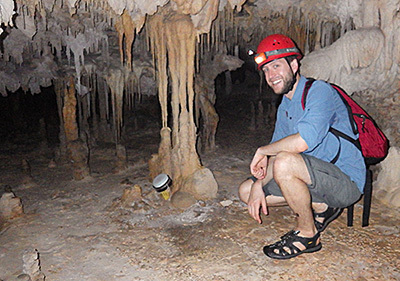 With so many good stalagmite-forming records in the bag, we decided to look at some of the amorphous flow-stone draperies on the periphery of the cave. 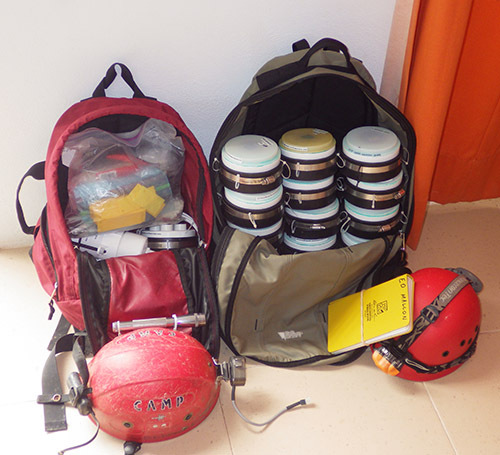 It will be interesting to see if we can develop a sense of how much these sources contribute to the water draining into the cave. 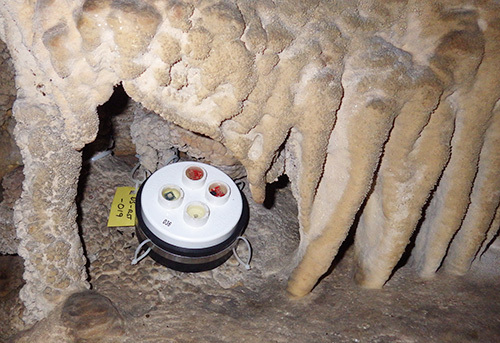 Although I had not yet determined if the Masons RH experiment was working, we decided to re-installed those multi-probe logger since they capture both temperature and barometric data, which is still very useful information for the project. 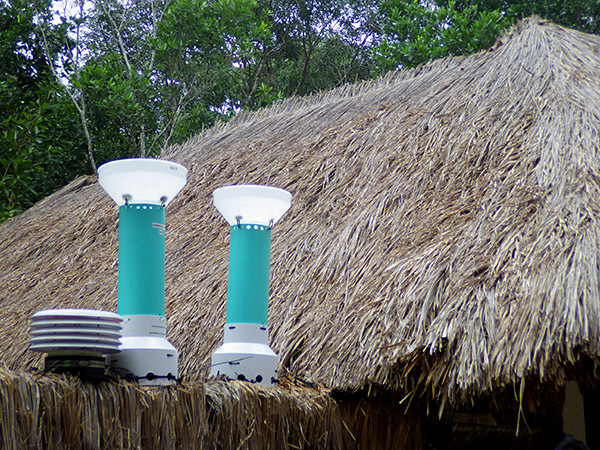 With the success of the rain gauges, we decided to disperse those loggers to topside locations ranging as far as Tulum. 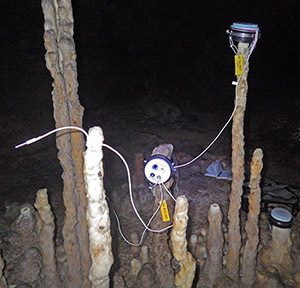 I will build more for the next deployment, as we would eventually like to have surface rain gauges at all of our cave monitoring sites (precipitation is as relevant to the flow loggers as it is to the drip sensors!). That’s a tall order, so I am happy that nearly all the units are delivering one-year or more operation on a set of batteries, so we no longer have to change them on every trip. As readers of this blog know, it’s been a long road bringing the project to the point where we can just leave the loggers in place if we run out of time, without loosing any data. 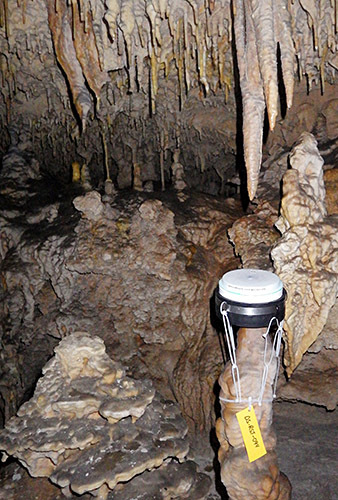 In all, there are now more than twenty five loggers in operation at Rio Secreto, which is the largest concentration of instruments we’ve ever had at one location. 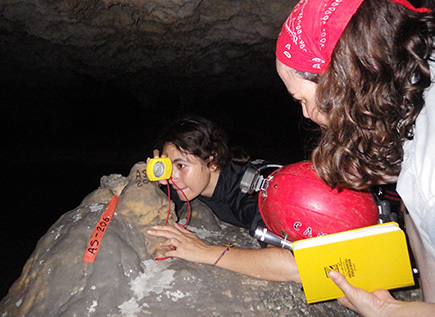 My hope is that the information we are gathering today helps to preserve their cave when the growing metropolis of Playa del Carmen reaches their doorstep. 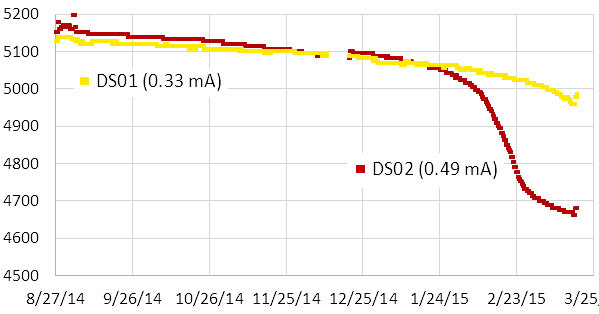 This entry was posted in Developing a DRIP ⚶ sensor, Expedition Reports & Updates on January 10, 2016 by edmallon. 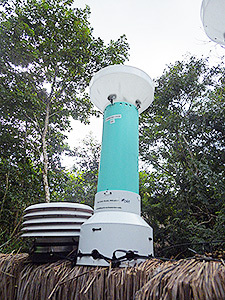 Field Report 2015-12-08: The DIY Logging Rain Gauges Work! 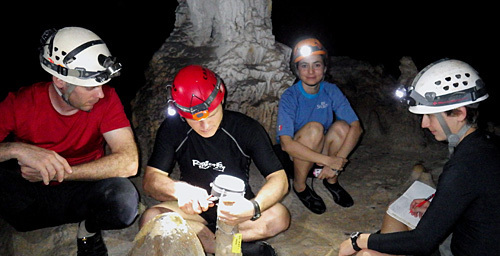 We managed to squeeze in a short fieldwork trip before the end of the year, and the growing number of loggers at Rio Secreto put that cave at the top of our list to give me enough time to service all the units. It was also important that we get everything back into place before they were swamped by tourists wanting to spend their holidays in the sun, rather than shoveling snow. Rain Gauge, Internal Temp (°C) from the DS3231 RTC register. Hopefully this means that the SD cards are back in the safe operating zone, which I know from past failures is nowhere near the 85°C that Sandisk claims. Well serves me right for counting my chickens: Turns out that the drip sensor based rain gauges suffer from spurious counts due to wind noise. But I’ve been running these guys at their highest sensitivity settings, so hopefully I can dial that back to reduce the problem. 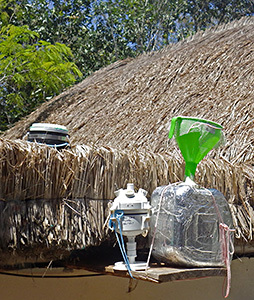 We also had the gauges on a soft palapa roof, which no doubt contributed to the problem. This entry was posted in * Developing NEW sensors *, Developing a DRIP ⚶ sensor, Expedition Reports & Updates on January 5, 2016 by edmallon. The next batch is ready to go! Sensor failures & battery leaks meant that I had to rebuild some of the drip loggers retrieved last week, in addition to loading all the units with the latest code tweaks for sensitivity, buffering, etc. Because the latest loggers have improved so much, Trish keeps telling me to retire the mixed bag of first-gens. But the maker geek in me just can’t resist the urge to give those aging units another run just to see how long they will last. (perhaps there’s a bit of self identification there..?) I’ve heard some of my coder friends refer to this kind of thing as a one tweak loop; often in association with tales of corporate disaster. Fortunately, the hard time constraints of fieldwork are more than enough to curtail my mild O.C.D because when deployment day arrives, you either have it in the bag or you don’t. 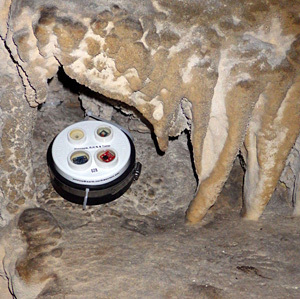 The first hygrometer, located in a cluster of drip sensors, with the “dry” bulb in the foreground, suspended far away from drip sources. And this time round we had more than twenty units going in. 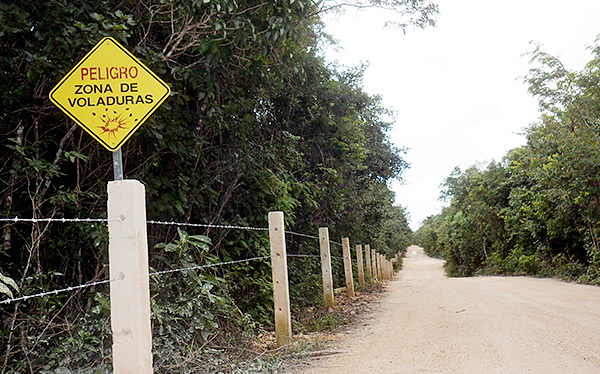 This was the reason that Trish & Fernanda had done so much surveying on our previous day at Rio Secreto. 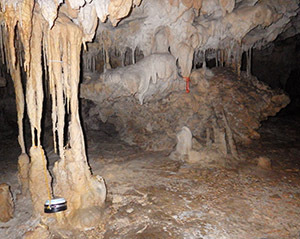 While they were taking measurements, I joked with Trish about playing Goldilocks in a chamber that was literally heaving with beautiful stalagmites, but the truth is picking a good one that doesn’t introduce a sampling bias, is a heck of allot more challenging than you might think. I left her to sort that out and do the manual counts, because I was so keen to get the two Masons hygrometers installed. 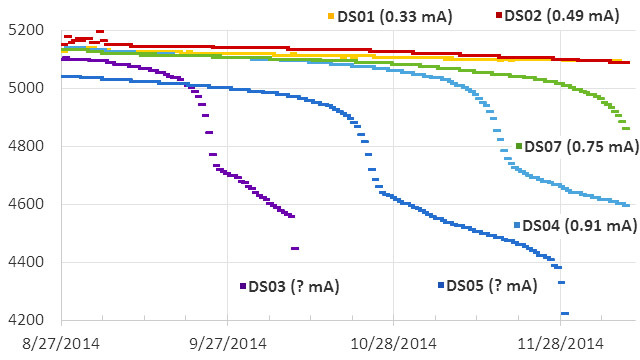 I’m hoping that the DS18’s can deliver another success, like we saw with the underwater temperature strings. 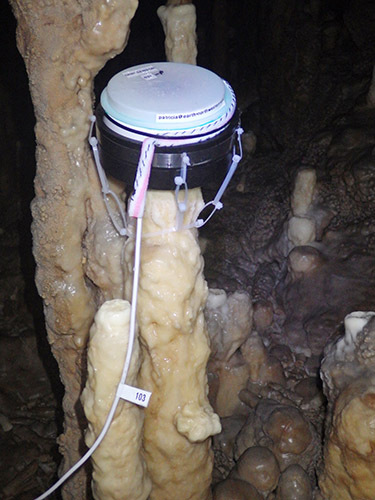 The key to this approach is that the wet bulb is hydrated by the run-off from a drip sensor station, hopefully allowing us to operate for long periods of time at these unsupervised locations. So those DS18’s have a very long wick wrapped around the rim of a drip logger with a cable tie. 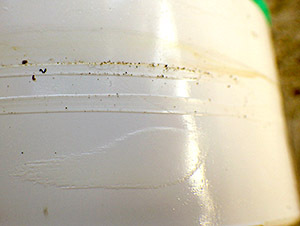 Encouraging evaporation like this is probably going to cause some mineral deposition, and there are a dozen other problems listed in the textbooks. But I am going to give it a shot anyway because there are few things as satisfying as discovering something you’ve built actually works, when authoritative sources say it won’t. 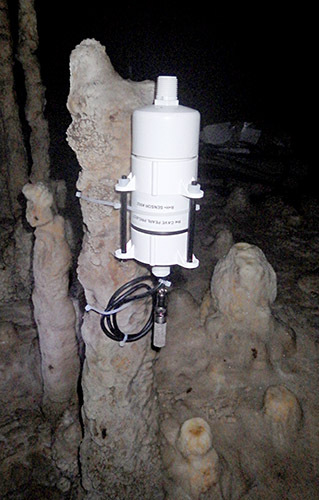 And we also have a new SHT-11 humidity logger installed nearby. The sensor itself is the soil moisture rig from Seeed, with a copper sintered mesh over the sensor that could ‘theoretically’ withstand full immersion. 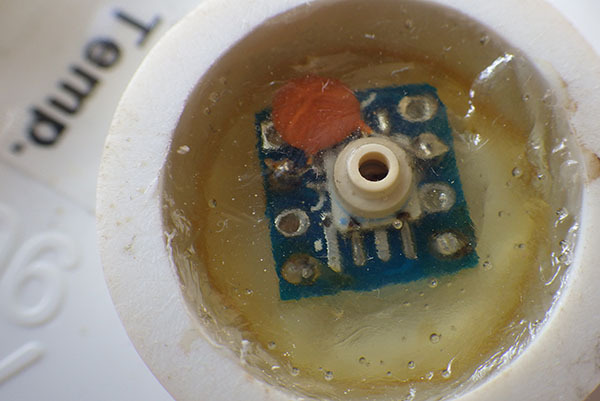 I tried to suspend the sensor head so that random drips from above would be deflected away, but even with liberal amounts of silicone on that breakout, I’ll be happy if we get a month of clean data from it before it suffers the same fate at the HTU21D’s we tried earlier. That ought to be enough to calibrate the Masons. Once we had the new toys in place, we could finish placement of the drip stations. A couple of the older stations suffered repeated knock-overs, so we decided to relocate those. One of the new sites was near a beautiful pancake-stack formation, but it only had a 12cm drip fall. That’s a very small amount of kinetic energy for my sensors to detect, and I watched this unit for 30 minutes to make absolutely sure the logger was picking it up. 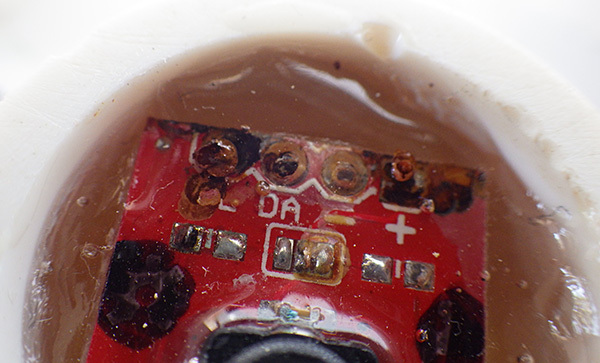 Though the drips made no sound at impact, the indicator LED was piping OK. 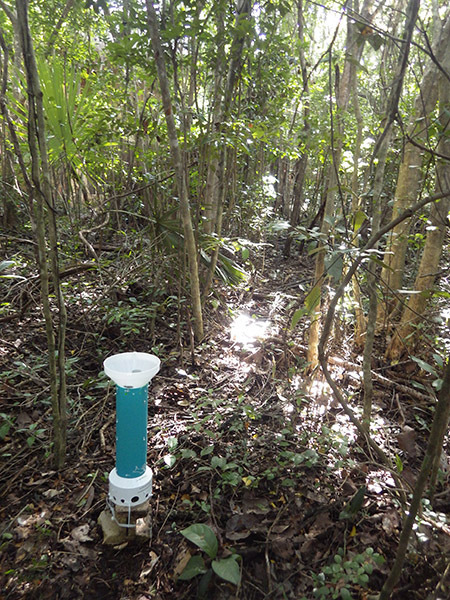 The new rain gauge loggers on their first real world installation. We wrapped up the day by putting the new logging rain gauges on the roof of a building, beside our solar shielded pressure/temp/r.h. sensors. 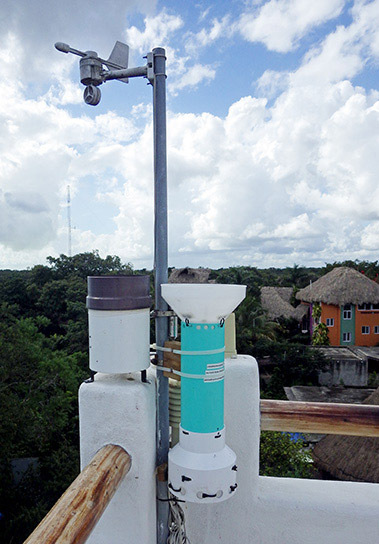 My hope is that those funnels give us a more quantitative record from the little drip sensors in the base, in addition to protecting them from that merciless tropical sun. Several people have pointed out to me that weather stations are getting pretty cheap these days, and then asked me why I don’t just use something off the shelf. 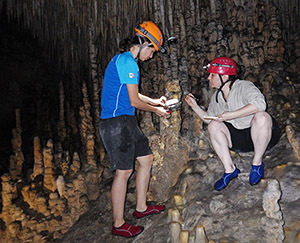 Generally, I just get a weird look when I reply: “Sure, but where’s the fun in that?” Fortunately for Trish & I, the people at Rio Secreto understand, and they have allowed us to use a corner of their amazing cave once again for the project. Thanks again you guys! 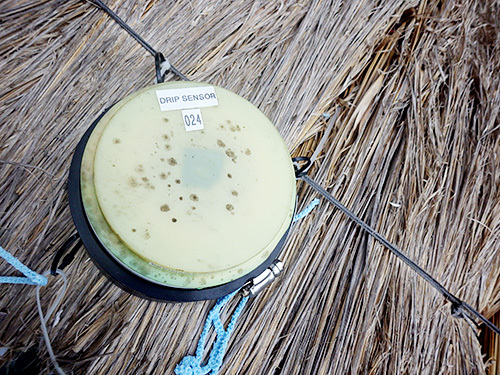 This entry was posted in Developing a DRIP ⚶ sensor, Expedition Reports & Updates on August 31, 2015 by edmallon.